Want to stop binge eating forever? Here’s how I discovered the formula to stop an addiction effortlessly and permanently. Would you like to wake up two years from now and realize that you have forgotten a box of ice-cream in the freezer for months, you don’t really want those sweets, cookies… the way you did anymore, your days go by without a craving, and this whole food problem has vanished as if it had never existed? If so, you want to read on and watch the video below because what I’m about to share with you is the exact FORMULA I used to ERADICATE ADDICTION entirely EFFORTLESSLY and the story of how I discovered it. If you already know me, then you aware that I have overcome at least half a dozen compulsive behaviors including sugar addiction and emotional eating. if you sense this internal switch turn on and suddenly food is all that you want and, the only thing you know is that it’s time to direct yourself towards the nearest food source and eat, then you know fighting food doesn’t help. Maybe you’ve heard this before. Maybe you believed it. Maybe you’ve tried it. Maybe you’ve blamed yourself for giving in. But fortunately for you, you are reading this post. And your life is about to get much easier because…. the formula I discovered doesn’t require any effort! About 12 years ago, I became addicted to this silly behavior. I wasted at least a month of my life indulging in this degrading habit that was robbing me of my dignity and joy. And what intrigued me was that I completely dropped this behavior without noticing it. I just woke up one day and realized that the urge and the acting out had been gone for two years as if they had never had existed. I didn’t go through a twelve-step program. I didn’t have to control or stop anything…. it just vanished. Wow! That was so different from the most common addiction and binge eating recovery plans out there. And, it got me curious. Why did the addiction start? And what resulted from answering those two questions changed my life forever. And, I reveal everything in the above video. 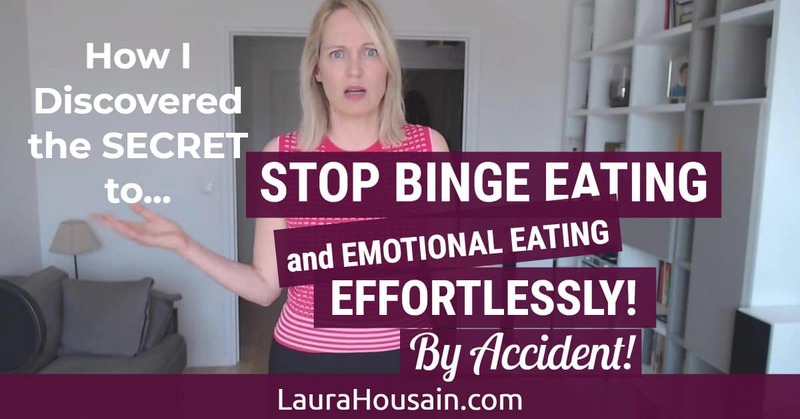 This is the exact formula I have used to help dozens of women stop binge eating and emotional eating forever laura’s way, the effortless way. ;-). 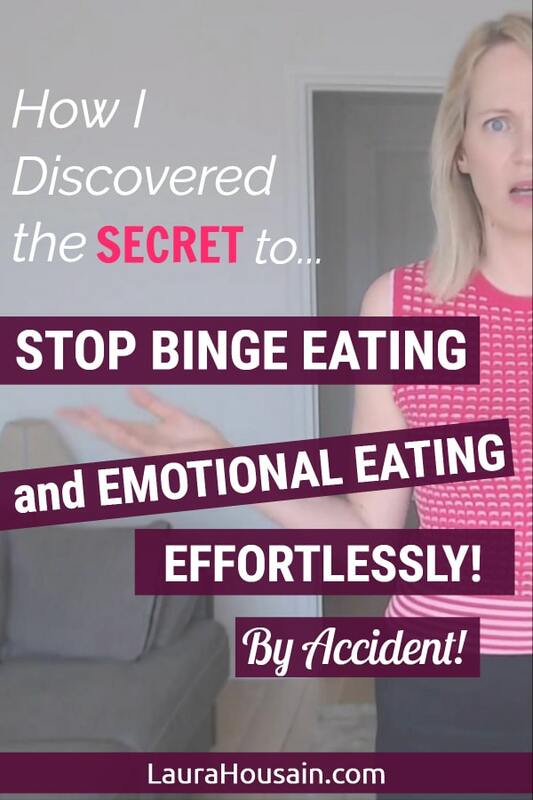 When I applied this formula to help women overcome emotional and binge eating, I saw them experience massive breakthroughs in weeks. The addiction vanished like it had for me. And, here is how to get Sara’s case-study. Her results completely blew me away. Now, tell me are you going to apply the information I have just shared with you? 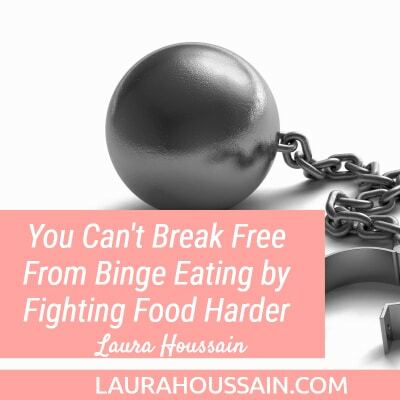 Are you willing to stop fighting food and stop binge eating forever effortlessly instead? Let me know in the comments. I would love to hear your thoughts. 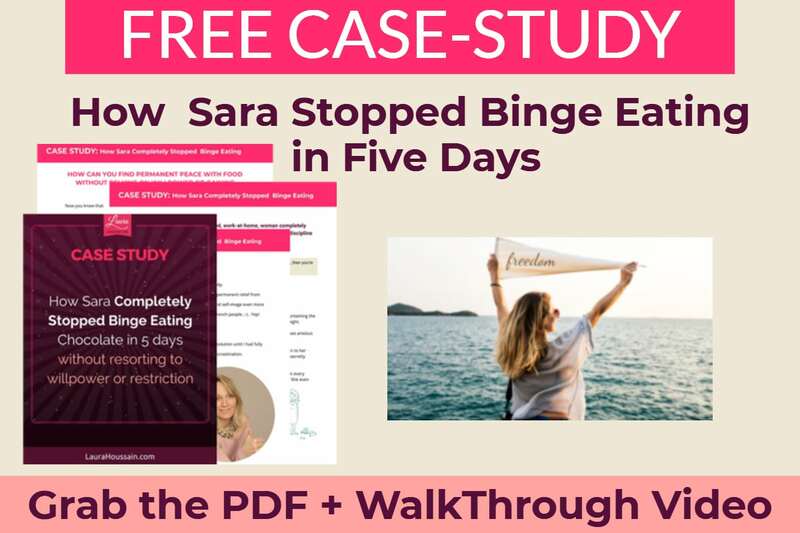 And, if you haven’t downloaded Sara’s case study that reveals exactly HOW she implemented the strategies I have just shared with you to stop binge eating effortlessly in 5 days after binging every night for years, here is your last chance to do so. Click here to grab your free copy of Sara’s case-study and access its complementary walk-through video.